Flexography is a major printing technique, widely used to print packaging materials. This technique is used to print on a number of materials and products including corrugated boxes, folding cartons, multi-wall sacks, paper sacks, plastic bags etc. Flexography is used for printing on various materials including plastic, paper etc. This printing technique makes use of flexible printing plates made of rubber or plastic. The inked plates with a slightly raised image are rotated on a cylinder which transfers the image to the substrate. A substrate is fed into the machine from a roll and the image, printed is a result of the substrate being pulled through a series of printing units. 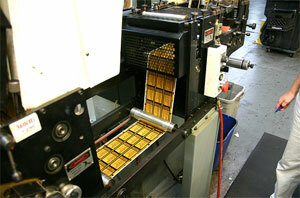 Each printing unit is responsible for printing a single color.